We're delighted to announce our bespoke Connoisseur collection. 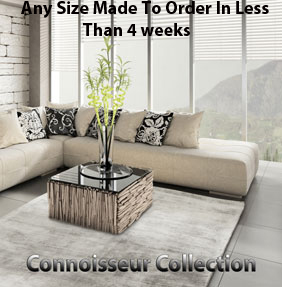 This beautiful collection consists of nine different ranges, each made to order in any size in less than 4 weeks! This high quality collection is hand-woven in either pure wool or shimmering viscose, each rug will have a luxury suede look tape edging. Just about any shape can be made, including - rectangle, irregular shapes, runners and squares. Samples of each range are available to order. Shifting Sands, Canterbury, Melbourne, Waterloo and Wellington which are made from 100% New Zealand wool. Claremont made from 3 ply wool. Eco-Rib which is made from natural undyed wool. Fitted broadloom carpet in either 4 or 5 metre widths is also available in each range.